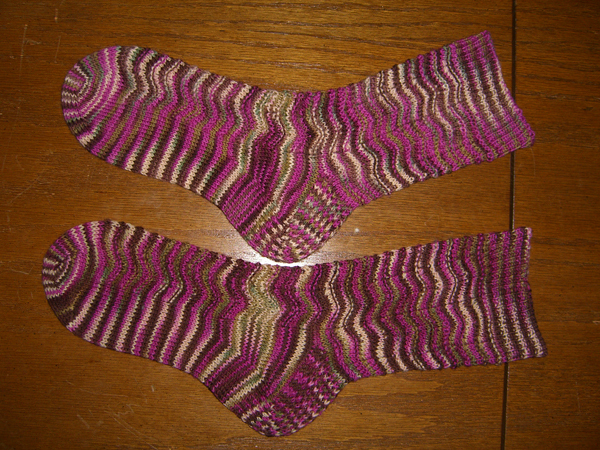 I finished the Wavy Raspberry (aka Vera) Socks last night! Yea!!! Bound off at Tangle Thursday knitting night and washed when I got home. Aren’t they pretty? I’m so not a pink person, but I just love how the raspberry color sets off the browns and creams and little dabs of teal. I love how the colors sort of spiral up the ankles. I love how it ended up reminding me of grandma’s old afghan. Usually when I get finished with something, it’s sort of like… oh yeah, another pair of socks; oh yeah, another sweater; meh. But every now and there’s a finished object that makes me just want to stop people on the street and say, “Look at what I made! I made this!” And that’s what I want to do with these. Stitch Pattern: A standard wavy stitch pattern with every 6th row purled. Well, here’s the proof that they do, indeed fit my feet perfectly! And my feet are very happy. I’m wearing these today with clogs, and despite the wavy, purly nature of the stitch pattern, the ankles are not at all slouching. As always, clicking the pics will get you a bigger version in a pop-up. I wish I could get decent natural-light pics at my house in the winter, but the bottom picture colors are fairly close to real life, at least on my monitor. Next up: Blue Moon Socks That Rock in colorway Falcon’s Eye, which is a mix of lovely soft greens. 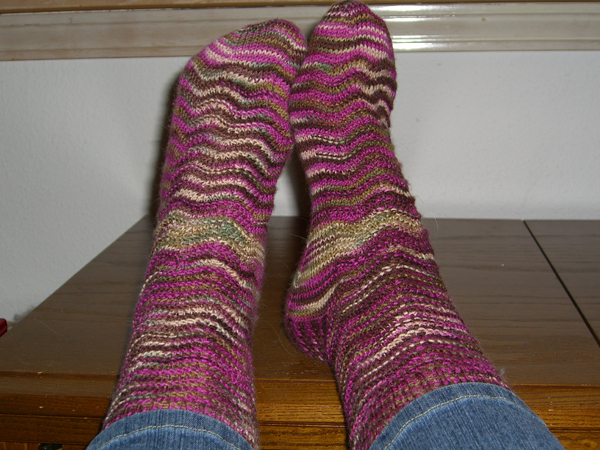 I’m currently thinking that I’ll do them in an all-over staggered ribbed cable. We’ll see if I still like that after I’ve knit a few inches. I also need to find just the perfect yarn for my Sockapaloooza pal’s socks. I may need to do a field trip this weekend to Woodland Wool Works. They tend to have unusual yarns that the rest of the Portland metro area LYSs don’t carry. I also need to find the perfect sock pattern for my pal, but I usually find that the yarn speaks to me and tells me what to knit with it. I want to make some really great socks, because my pal makes pretty great socks!